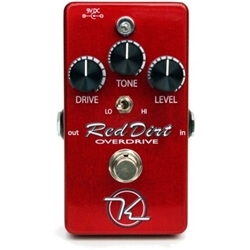 The Red Dirt overdrive began from a quest to find the perfect classic drive sound while also offering new levels of sonic versatility to satisfy a wider range of musical styles. Founder and head engineer Robert Keeley took this idea and combined the great sounds found within his original "Mod Plus" and "Baked" modified pedals and added refinements found exclusively in his custom pedal line. By incorporating these tones along with the Keeley standard of U.S.A. hand-built quality using premium components, the Red Dirt overdrive aims to become an indispensable part of any pedal chain.